Makes a great deal of filling, at least 3 omeletts’ worth. 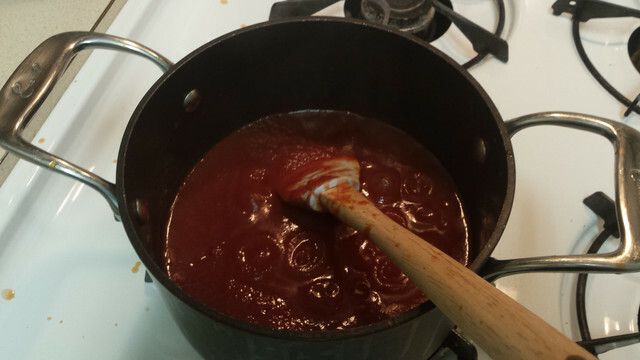 *A note on the ingredients for the sauce (water, tomato sauce, beef stock, vinegar)- In my pictures, I used half of the measurements given above. 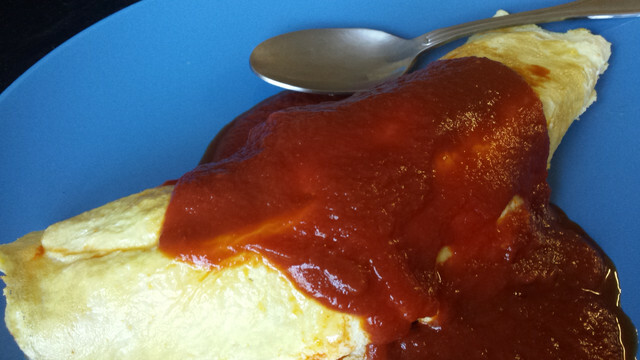 In the end, I only had enough sauce for two meagerly sauced omelettes, but a lot of filling left over. If you won’t be eating more than two, half the measurements. If you like sauce, as I do, go with what I have listed above. 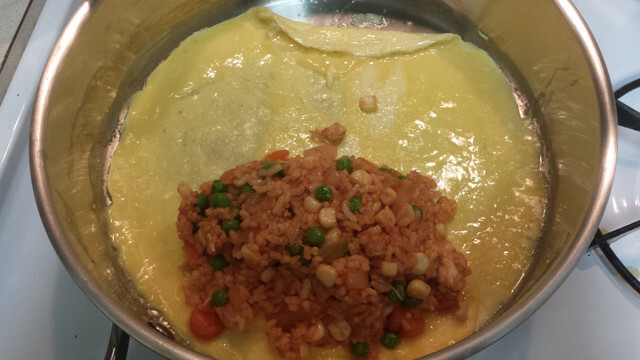 “Making the Omu-Rice!Begin by pouring your tomato sauce into a saucepan on the stove. 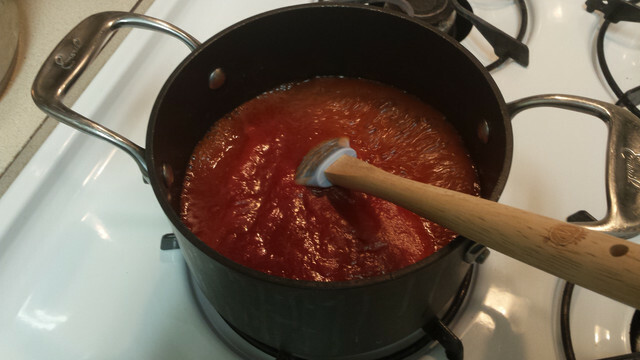 Dissolve beef stock into 1 cup of water, preferably water you used to rinse out the inside of the tomato can. Pour this into the pot as well. Add a dash of the vinegar to taste. 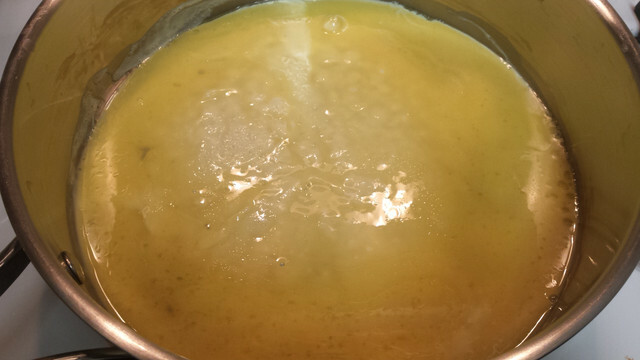 Allow the whole thing to reduce by half over low heat, stirring every so often to make sure nothing burns. This took me about an hour, and resulted in quite a mess (not pictured). Make sure you also taste-test periodically. Add more salt and pepper if it seems boring. 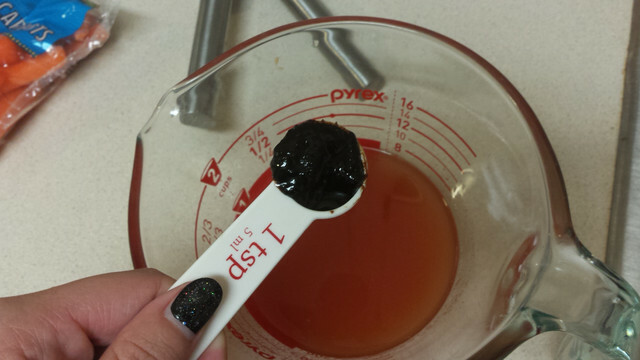 If, after you add the vinegar, it seems way too sour, just add a little sprinkle of sugar until you get the flavor back to where you want it. When the sauce is done/ almost ready, start with the rest of the meal. 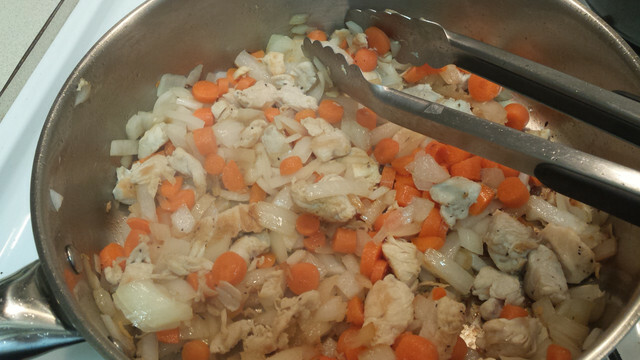 Chop your carrots, onions, and chicken. 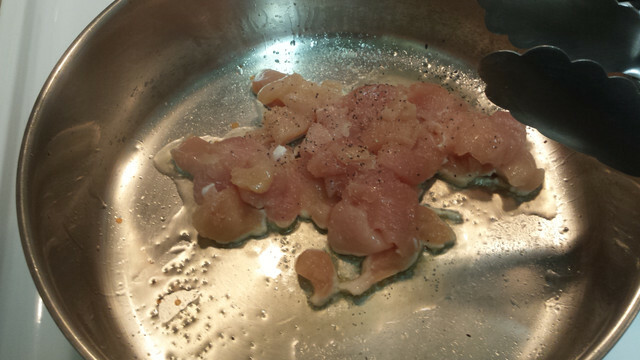 In a large pan over medium heat, heat some olive oil and add the chicken, salting and peppering generously. When you can’t see any more pink, add onion and allow to soften for about two minutes. Then, add in the carrot and allow to cook for 5-7 minutes, or until carrot is tender. If it takes longer, do not fear. Accept the chill while you sit back and wait for the carrots to be ready. 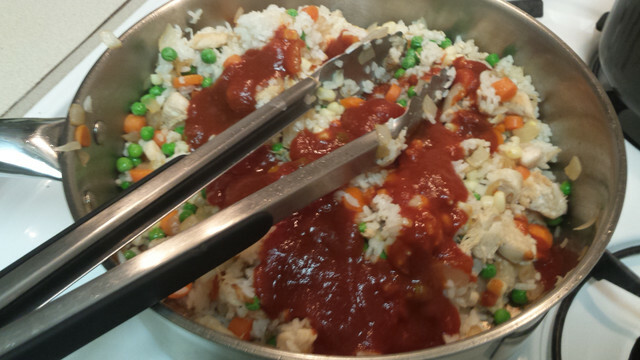 Then, when everything is nicely cooked and tender, add the rice. 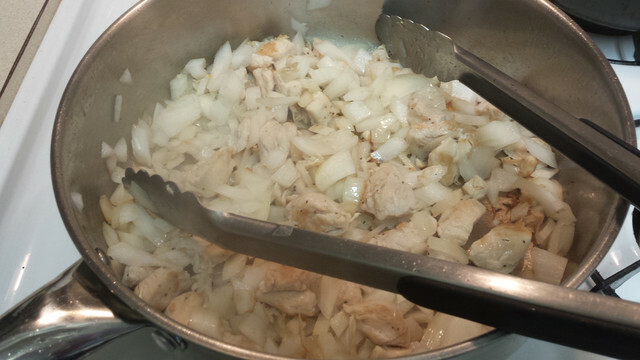 Work out any clumps and mix it thoroughly with the rest of the ingredients. 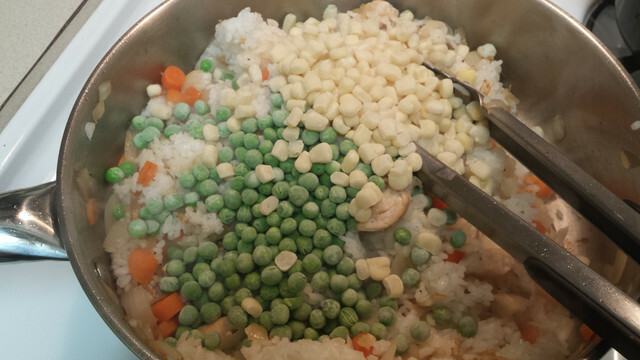 Add in the peas and corn, and don’t worry- they’ll thaw very quickly. Next, add in about half the sauce, and stir through. Taste the mixture- if it seems bland, try adding some salt and pepper. Once this is thoroughly mixed, set the burner on low and set aside. Get out a clean pan, one for making egg pancakes. This is the tricky part about making omelettes- I recommend using a pan with sloped sides so it’s easier to work a spatuala around the outside. I only have pans that go straight up, and I struggled like no other to make an omelette using this kind of pan. Set over medium low heat and oil generously to prevent sticking. 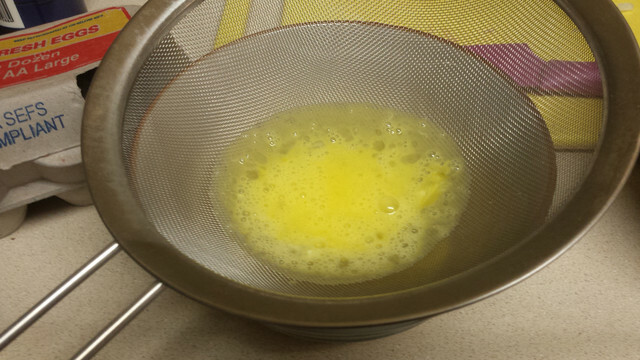 Crack three eggs (if just making one, double for more) into a bowl, and whisk together. Then, optionally, strain into another bowl to create a nice texture for your pancake. Salt and pepper well. When the pan is nicely warmed, and a streak of egg in the pan cooks through immediately, pour in the eggs. Because we’re making a traditional omu-rice, allow the pancake to cook until the top is no longer gel-like and is cooked through. Turn heat down very low, and spoon some of the filling into one end. That was way too much mixture for me, actually. Go with less. Less is more. You can always shove more filling in later. 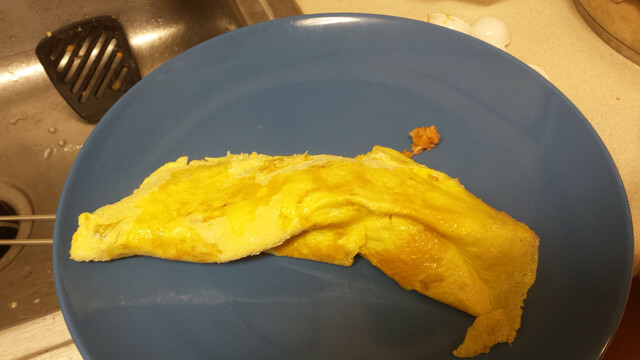 Also, I’m really bad at making omelettes, so if you can think of an easier way to do this (Just sitting here I can think of at least one easier way to do this. I have no idea what I was thinking when I made this. ), please make this easy on yourself. Carefully roll the pancake around the omelette and flip out onto a plate. Here’s what mine looked like before I touched it up. Absolutely beautiful. With the magic of paper towels, take some time to rearrange this so that the filling isn’t spilling out, and it looks like a normal omelette, not like an omelette that decided to tragically end its life by jumping from a tall building. This is also a prime time to shove more filling in before you tuck the edges down nice and properly, in case you didn’t put enough in the omelette to begin with. Spoon some of the leftover, warmed sauce over the top and voila! This was really good! I was pleasantly surprised. 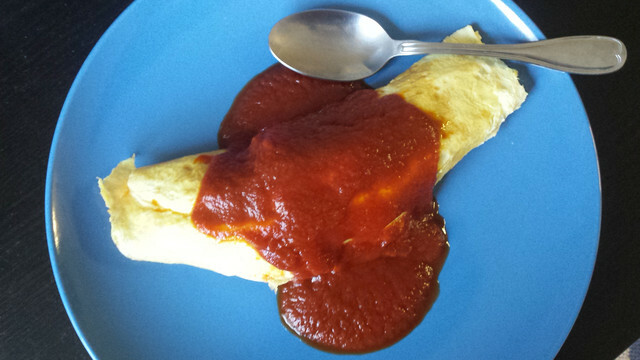 To do a taste comparison, we tested out an omelette with a ketchup garnish and an omelette with my sauce. My sauce won by impressive margins- it had a better flavor profile, wasn’t overwhelmingly sweet, and had more complexity. The ketchup just couldn’t compete, though it wasn’t BAD. It just wasn’t that great either. 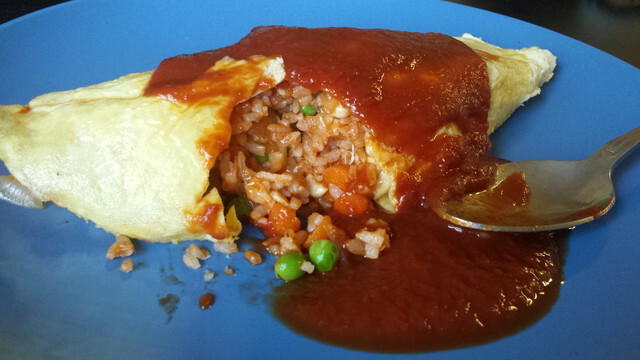 I was honestly expecting a repeate Charlotte omurice, but this turned out really well. The filling isn’t overwhelmingly sweet, or really even sweet at all, and the vegetables make for a nice combination of flavors. I made sure to salt everything thoroughly, and as a result I found myself gobbling it up, eggy exterior and all. If you garnish with a great deal of sauce, you can’t really taste the egg, which was a total plus in my book.